Actresses - Welcome to Our Generation USA! Covers Actresses in Television, Stage and/or Movies, including Award Ceremonies. YouTube Video of Ursula Andress as Honey Rider in "Dr. No"
​Pictured: Halle Berry as "Jinx" & Ursula Andress as "Honey Rider"
A Bond girl is a character (or the actress portraying a character) who is a love interest of James Bond in a novel film or video game. Click here for more about Bond Girls. Pictured: Sally Field as "Norma Rae" (1979) & Julia Roberts as "Erin Brockovich"
Since its inception, the award has been given to 73 actresses. Katharine Hepburn has won the most awards in this category, with four Oscars. Meryl Streep has been nominated on 15 occasions (resulting in two awards), more than any other actress. As of the 2015 ceremony, Julianne Moore is the most recent winner in this category for her role as Alice Howland in "Still Alice" (2014 Movie). ​Pictured: Marisa Tomei for "My Cousin Vinny" & Anne Hathaway for "Les Miserables"
The Academy Award for Best Supporting Actress is an award presented annually by the Academy of Motion Picture Arts and Sciences (AMPAS). It is given in honor of an actress who has delivered an outstanding performance in a supporting role while working within the film industry. Since its inception, the award has been given to 77 actresses. Dianne Wiest and Shelley Winters have received the most awards in this category with two awards each. Despite winning no awards, Thelma Ritter was nominated on six occasions, more than any other actress. As of the 2016 ceremony, Alicia Vikander is the most recent winner in this category for her role as Gerda Wegener in The Danish Girl. Primetime Emmy Award for Outstanding Lead Actress – a Drama Series. ​Pictured: Tyne Daly in "Cagney & Lacy" & Mariska Hargitay in "Law & Order SVU"
This is a list of winners of the Primetime Emmy Award for Outstanding Lead Actress – a Drama Series. Beginning with the 18th Emmys leading actresses in drama have competed alone. However, these dramatic performances included actresses from miniseries, telefilms, and guest performers competing against main cast competitors. Click here for more about a List of Winners of the Primetime Emmy Award for Outstanding Lead Actress in a Drama Series. Primetime Emmy Award for Outstanding Lead Actress in a Comedy Series. YouTube Video of Lucy Crushing Grapes with Her Feet! ​Pictured: Lucille Ball in "I Love Lucy" and Jennifer Aniston in "Friends"
This is a list of winners of the Primetime Emmy Award for Outstanding Lead Actress in a Comedy Series. Beginning with the 18th Emmys, leading actresses in comedy have competed alone. However, these comedic performances included actresses from miniseries, telefilms, and guest performers competing against main cast competitors. From the 1950s to Recent. 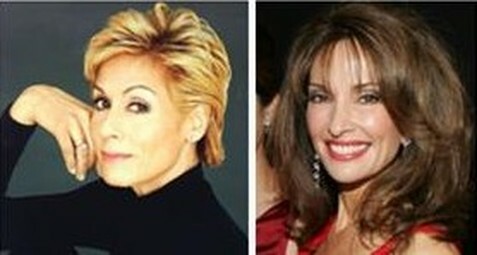 ​Pictured: Judith Light for "One Life to Live" & Susan Lucci for "All My Children"
Susan Lucci has been nominated on 21 occasions, more than any other actress. As of the 2016 ceremony, Mary Beth Evans is the most recent winner in this category for her portrayal of Kayla Brady on Days of Our Lives. The best actresses ever are ranked here in this list of the best actresses in film history. These are the greatest actresses ever to appear on the silver screen - female only (to vote on both genders, check out this list of the greatest film actors and actresses). These women were part of some of the greatest movies of all time (or were perhaps the reason they were the best movies ever), with countless Academy Awards between them. 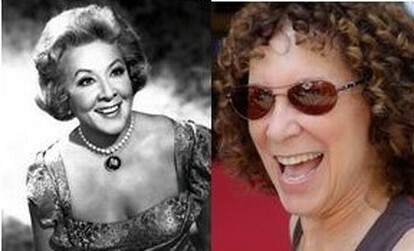 Pictured: Vivian Vance of "The Honeymooners" & Rhea Perlman from "Cheers". This is a list of winners of the Primetime Emmy Award for Outstanding Supporting Actress in a Comedy Series. In early Emmy ceremonies, the supporting categories were not always genre, or even gender, specific. Beginning with the 22nd Emmys, supporting actresses in comedy have competed alone. However, these comedic performances often included actresses from miniseries, telefilms, and guest performers competing against main cast competitors. YouTube Video by Nancy Sinatra singing "These Boots are made for walking"
Other defining recordings include "Sugar Town", the 1967 number one "Somethin' Stupid" (a duet with her father), the title song from the James Bond film You Only Live Twice, several collaborations with Lee Hazlewood such as "Jackson", and her cover of Cher's "Bang Bang (My Baby Shot Me Down)". Nancy Sinatra began her career as a singer and actress in November 1957 with an appearance on her father's ABC-TV variety series, but initially achieved success only in Europe and Japan. In early 1966 she had a transatlantic number-one hit with "These Boots Are Made for Walkin'". She appeared on TV in high boots, and with colorfully dressed go-go dancers, creating a popular and enduring image of the Swinging Sixties. The song was written by Lee Hazlewood, who wrote and produced most of her hits and sang with her on several duets, including the critical and cult favorite "Some Velvet Morning". In 1966 and 1967, Sinatra charted with 13 titles, all of which featured Billy Strange as arranger and conductor. Sinatra also had a brief acting career in the mid-1960s including a co-starring role with Elvis Presley in the movie Speedway, and with Peter Fonda in The Wild Angels. In Marriage on the Rocks, Frank and Nancy Sinatra played a fictional father and daughter. She has won five Golden Globe Awards and been nominated for two Academy Awards, two Grammy Awards, a Screen Actors Guild Award, and six Emmy Awards. In 2010, she won her first Emmy Award for her guest appearance on Law & Order: Special Victims Unit. Her singing and acting careers span five decades, starting in 1961; initially she was billed as a female version of Elvis Presley. She had a minor hit in 1961 and a charting album in 1964, and scored a disco hit in 1979. In 2001 she recorded a critically acclaimed gospel album, and an album of Christmas songs from 2004 continues to be available. YouTube Video from The Graduate (1967) - "Mrs. Robinson, you're trying to seduce me. Aren't you?" ​Pictured: LEFT: Dustin Hoffman & Anne Bancroft autographed "The Graduate" (1967) Movie Soundtrack LP (music by Simon & Garfunkel); RIGHT: Photo of Anne Bancroft as Annie Sullivan and Patty Duke as Helen Keller in the "The Miracle Worker" (1962) Movie. Anna Maria Louisa Italiano (September 17, 1931 – June 6, 2005), known professionally as Anne Bancroft, was an American actress associated with the method acting school, having studied under Lee Strasberg. Respected for her acting prowess and versatility, Bancroft was acknowledged for her work in film, theatre and television. She won one Academy Award, three BAFTA Awards, two Golden Globes, two Tony Awards and two Emmy Awards, and several other awards and nominations. After her film debut in Don't Bother to Knock (1952) and a string of supporting film roles during the 1950s, she won an Academy Award for Best Actress for her lead role in The Miracle Worker (1962) as the teacher of teenage Helen Keller, reprising her role in the Broadway stage play. She won both an Oscar for her work in the film, and a Tony for the same role in the play. On Broadway in 1965, she played a medieval nun obsessed with a priest (Jason Robards) in John Whiting's play The Devils, based on the Aldous Huxley novel The Devils of Loudun. She was perhaps best known as the seductress, Mrs. Robinson, in The Graduate (1967), a role that she later stated had come to overshadow her other work. Bancroft received several other Oscar nominations and continued in lead roles until the late 1980s. She played a ballet dancer in The Turning Point (1977), and in Agnes of God she played the mother superior of a convent who clashes with a psychiatrist played by Jane Fonda over dealings with a troubled young novice nun played by Meg Tilly. In 1987, she starred with Anthony Hopkins in 84 Charing Cross Road. She appeared in several movies directed or produced by her second husband, comedian Mel Brooks, including the award-winning drama The Elephant Man (1980) as well as comedies To Be or Not to Be (1983) and Dracula: Dead and Loving It (1995). 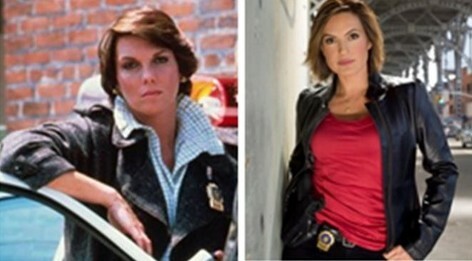 ​Pictured: Angie Dickinson in LEFT: “Police Woman” (NBC: 1974-1978); RIGHT: With John Wayne in the Western Movie “Rio Bravo” (1959). Dickinson has appeared in more than 50 films, including Ocean's 11 (1960), The Sins of Rachel Cade (1961), Jessica (1962), Captain Newman, M.D. (1963), The Killers (1964), The Art of Love (1965), The Chase (1966) and the neo-noir classic Point Blank (1967). From 1974 to 1978, Dickinson starred as Sergeant Leann "Pepper" Anderson in the NBC crime series Police Woman, for which she received Golden Globe Award for Best Actress – Television Series Drama and three Primetime Emmy Award for Outstanding Lead Actress in a Drama Series nominations. Pictured: Scenes of Jennifer Beals in the movie "Flashdance"
Jennifer Beals (born December 19, 1963) is an American actress and a former teen model. She is best known for her role as Alexandra "Alex" Owens in the 1983 romantic drama film Flashdance, and starred as Bette Porter on the Showtime drama series The L Word. Beals earned an NAACP Image Award and a Golden Globe Award nomination for the former. She has appeared in more than 50 films. ​YouTube Video: Marilu Henner discusses talking about her memory on "60 Minutes"
Mary Lucy Denise Henner (born April 6, 1952) is an American actress, producer, radio host, and author. She began her career appearing in the original production of the musical Grease in 1971, before making her screen debut in the 1977 comedy-drama film Between the Lines. In 1977, Henner was cast in her breakthrough role as Elaine O'Connor Nardo in the ABC/NBC sitcom Taxi, a role she played until 1983 and received five Golden Globe Award nominations. Henner later has had co-starring roles in films such as Hammett (1982), The Man Who Loved Women (1983), Cannonball Run II (1984), Johnny Dangerously (1984), Rustlers' Rhapsody (1985), L.A. Story (1991), and Noises Off (1992). She returned to television with a starring role in the CBS sitcom Evening Shade (1990–94), and later had leading roles in many made-for-television movies. Henner has hyperthymesia or total recall memory; she can remember specific details of virtually every day of her life since she was a small child. On December 19, 2010, the CBS News program 60 Minutes aired a segment which featured six individuals thought to have this condition (see above YouTube Video). As a longtime friend of 60 Minutes correspondent Lesley Stahl, Henner was included on the show. Henner also discussed her superior memorization abilities on other programs, such as CBS's The Early Show, NBC's The Today Show, ABC's The View, and Howard Stern's Sirius XM show. Henner's ninth book, Total Memory Makeover: Uncover Your Past, Take Charge of Your Future, was released on April 24, 2012. To promote Total Memory Makeover, she appeared on Anderson Live (then known as simply Anderson), The View, Piers Morgan Tonight, Good Morning America, CBS This Morning, The Talk, The Dr. Oz Show, and numerous other radio and TV media outlets. She was also on episode 414 of the podcast My Brother, My Brother, and Me on July 10, 2018. Click here for more about Marilu Henner. Beckinsale appeared in British costume dramas such as Prince of Jutland (1994), Cold Comfort Farm (1995), Emma (1996), and The Golden Bowl (2000), in addition to various stage and radio productions. Beckinsale began to seek film work in the United States in the late 1990s and, after appearing in small-scale dramas The Last Days of Disco (1998) and Brokedown Palace (1999), she had starring roles in the war drama Pearl Harbor (2001), the romantic comedy Serendipity and Tiptoes (2003). She followed those with appearances in The Aviator (2004) and Click (2006). Since being cast as Selene in the Underworld film series (2003–2016), Beckinsale has become known primarily for her work in action films, including Van Helsing (2004), Whiteout (2009), Contraband (2012), and Total Recall (2012). Beckinsale also continues to make appearances in smaller dramatic projects such as Snow Angels (2007), Nothing but the Truth (2008), and Everybody's Fine (2009). In 2016, she received critical acclaim for her performance in the period comedy film Love & Friendship. Click here for more about Kate Beckinsale. ​Lupita Amondi Nyong'o (Kenyan English; born March 1, 1983) is a Kenyan-Mexican actress. The daughter of Kenyan politician Peter Anyang' Nyong'o, she was born in Mexico City, where her father was teaching, and was raised in Kenya from the age of one. She attended college in the United States, earning a bachelor's degree in film and theater studies from Hampshire College. Nyong'o began her career in Hollywood as a production assistant. In 2008, she made her acting debut with the short film East River and subsequently returned to Kenya to star in the television series Shuga (2009–2012). Also in 2009, she wrote, produced and directed the documentary In My Genes. She then pursued a master's degree in acting from the Yale School of Drama. Soon after her graduation, she had her first feature film role as Patsey in Steve McQueen's historical drama 12 Years a Slave (2013), for which she received critical acclaim and won several awards, including the Academy Award for Best Supporting Actress. She became the first Kenyan and Mexican actress to win an Academy Award. Nyong'o made her Broadway debut as a teenage orphan in the critically acclaimed play Eclipsed (2015), for which she was nominated for a Tony Award for Best Actress in a Play. She went on to perform a motion capture role as Maz Kanata in the Star Wars sequel trilogy (2015–2019) and a voice role as Raksha in The Jungle Book (2016). Nyong'o's career progressed with her role as Nakia in the Marvel Cinematic Universe superhero film Black Panther (2018) and her starring role in Jordan Peele's critically acclaimed horror film Us (2019). ​In addition to acting, Nyong'o supports historic preservation. She is vocal about preventing sexual harassment and working for women and animal rights. In 2014, she was named the most beautiful woman by People. Click here for more about Lupita Nyong'o.